Photographing writers is not new. Many other photographers have specialized in images of authors. Two photographers who introduced me to the idea of photographing writers were John Reeves and Sam Tata. Reeves, a Toronto photographer who works with a large format camera, is known for his images of people connected with the arts, including writers. He shoots tightly cropped images of faces. His book About Face was published by Exile Editions. The late Sam Tata, a contemporary and friend of the great French photographer Henri Cartier-Bresson, published several books showcasing his images of writers. 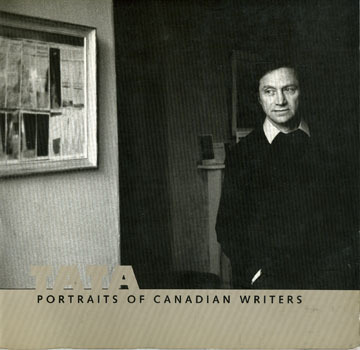 Tata immigrated to Canada in the fifties and lived in Montreal working mainly for magazines. Every artist tries to be original in his or her work. Reeves, through use of a different camera format and a studio setting, creates images that look far different from mine. I did not meet Sam Tata until very near the end of his life. He was suffering the effects of several strokes and a normal question and answer conversation was not possible. However when we looked through his scrapbooks, the memories took over and anecdotes about the images and people came out. Currently the biggest name in writer photographs is the American Marion Ettlinger. Her stylized black and white portraits grace many book covers. A collection of her images was published as ‘Author Photo’. Two British photographers, who worked for London newspapers, Sally Soames (The Times) and Jane Bown (The Guardian) are also noted for their pictures of writers. Soames has a collection of her photos out titled simply ‘Writers” and Bown has had a number of books out that include her writer portraits. Finally, the grand dame of writer portraiture is New Yorker Jill Krementz, a photographer who loved the subject so much she married one her subjects, the late Kurt Vonnegut.